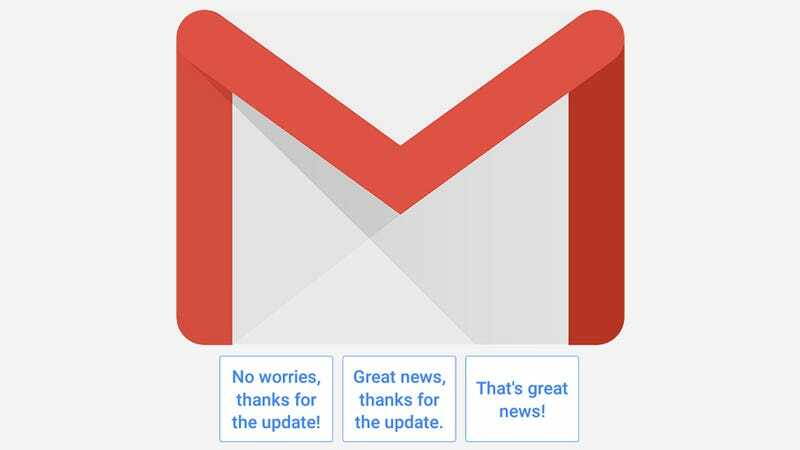 The Wall Street Journal spoke with numerous Gmail users who are a little weirded out by the now-fully rolled out Smart Reply feature that scans your email for context and suggests three potential replies. Among the anecdotes about awkward interactions and giving up our personhood to the machines, the piece also revealed that Google will soon make the feature optional on desktops. A good Smart Reply will be something like “Congratulations!” in response to a colleague saying they’ve just received a promotion, while a bad Smart Reply might be something like “Thanks a lot!” when your boss messages to say that the quarter was down and they just want to give everyone a heads up that layoffs are on the way. Gmail only recently rolled the feature out as a default on the desktop for its 1.4 billion active accounts and the company told the Journal that around 10 percent of all Gmail responses are generated by the tool. But even if everyone thought that Smart Reply is “Sweet!” and “Awesome!”, tech companies should give users control over every setting they can reasonably offer. Unfortunately, you’ll have to wait until next month to disable it on your desktop. We’ve reached out to Google to ask if it has a precise date for when the option will be available, but we didn’t receive an immediate reply. By the end of this month, Gmail will also be rolling out its Smart Compose option to all users by default. This is essentially a context-sensitive auto-complete tool that attempts to fill in full sentences in your replies. So many email interactions simply require a robotic response, so I haven’t felt at all unnerved by Smart Reply, but I have worried that it’ll be too obvious that I’m using stock responses. For now, I’m disabling it on my phone, but I encourage all of you to keep using it so that it’ll improve and I can come back to reap the rewards.